After you study this page, you can download a free OTDR simulator to run on your PC. The Optical Time Domain Reflectometer (OTDR) is useful for testing the integrity of fiber optic cables. It can verify splice loss, measure length and find faults. The OTDR is also commonly used to create a "picture" of fiber optic cable when it is newly installed. Later, comparisons can be made between the original trace and a second trace taken if problems arise. Analyzing the OTDR trace is always made easier by having documentation from the original trace that was created when the cable was installed. OTDRs are most effective when testing long cables (more than aproximatley 250 meters or 800 feet) or cable plants with splices. The data that the OTDR produces are typically used to create a picture called a "trace" or "signature" that has valuable information for the trained user and can be stored for later reference or to check against a blueprint when network trouble arises. OTDRs should not be used for measuring insertion loss in the fiber optic cable - that task is better left to a fiber optic test source and power meter. OTDRs simply show you where the cables are terminated and confirm the quality of the fibers, connections and splices. Of course, OTDR traces are also used for troubleshooting, since they can show where breaks are in fiber when traces are compared to installation documentation. Unlike sources and power meters which measure the loss of the fiber optic cable plant directly, the OTDR works indirectly. The source and meter duplicate the transmitter and receiver of the fiber optic transmission link, so the measurement correlates well with actual system loss. The OTDR, however, uses a unique optical phenomena of fiber to indirectly measure loss. The biggest factor in optical fiber loss is scattering. In fiber, light is scattered in all directions, including some scattered back toward the source as shown here. The OTDR uses this "backscattered light" to make measurements along with reflected light from connectors or cleaved fiber ends. The OTDR consists of a high power laser transmitter that sends a pulse of light down the fiber. Back-scattered light and reflected light returns to the OTDR through the fiber and is directed to a sensitive receiver thorugh a coupler in the OTDR front end. For each measurement, the OTDR sends out a very high power pulse and measures the light coming back over time. At any point in time, the light the OTDR sees is the light scattered from the pulse passing through a region of the fiber. Think of the OTDR pulse as being a "virtual source" created by the scattering that is testing all the fiber between itself and the OTDR as it moves down the fiber. Since it is possible to calibrate the speed of the pulse as it passes down the fiber from the index of refraction of the glass in the core of the fiber, the OTDR can correlate what it sees in backscattered light with an actual location in the fiber. Thus it can create a display of the amount of backscattered light at any point in the fiber along its length. There are some calculations involved. Remember the light has to go out and come back, so you have to factor that into the time calculations, cutting the time in half. One must also cut the loss in half, since the light sees loss both ways. The power loss is a logarithmic function, so the power is measured and displayed in dB. The amount of light scattered back to the OTDR is proportional to the backscatter of the fiber, peak power of the OTDR test pulse and the length of the pulse sent out. If you need more backscattered light to get good measurements, you can increase the pulse peak power or pulse width or send out more pulses and average the returned signals. All three are used in many OTDRs, with user control of some of the selections. OTDRs are always used with a launch cable and may use a receive cable. The launch cable, sometimes also called a "pulse suppressor," allows the OTDR to settle down after the test pulse is sent into the fiber and provides a reference connector for the first connector on the cable under test to determine its loss. A receive cable may be used on the far end to allow measurements of the connector on the end of the cable under test also. They say a picture is worth a thousand words, and the OTDR picture (or "trace" as they are called) takes a lot of words to describe all the information in it! Consider the diagram of a trace at the right. The slope of the fiber trace shows the attenuation coefficient of the fiber and is calibrated in dB/km by the OTDR. 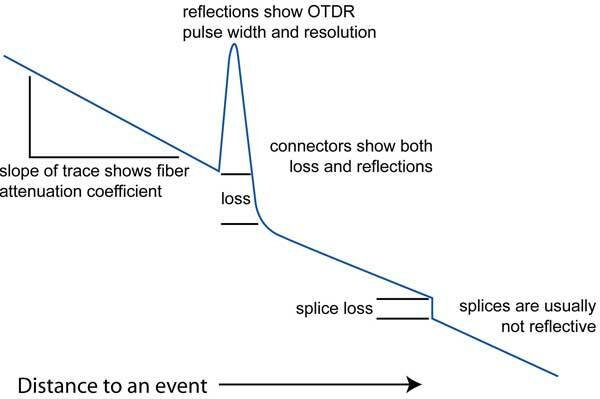 In order to measure fiber attenuation, you need a fairly long length of fiber with no distortions on either end from the OTDR resolution or overloading due to large reflections. If the fiber looks nonlinear at either end, especially near a reflective event like a connector, avoid that section when measuring loss. Connectors and splices are called "events" in OTDR jargon. 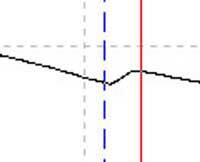 Both should show a loss, but connectors and mechanical splices will also show a reflective peak. The height of that peak will indicate the amount of reflection at the event, unless it is so large that it saturates the OTDR receiver. Then peak will have a flat top and tail on the far end, indicating the receiver was overloaded. 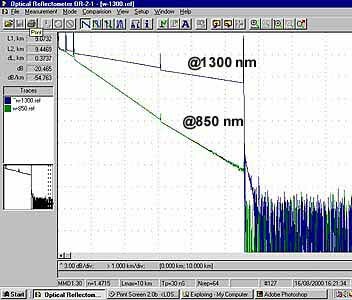 Reflective pulses can show you the resolution of the OTDR. You cannot see two events closer than is allowed by the pulse width. Generally longer pulse widths are used to be able to see farther along the cable plant and narrower pulses are used when high resolution is needed, although it limits the distance the OTDR can see. Fiber Attenuation by Two Point Method. The OTDR measures distance and loss between the two markers. This can be used for measuring loss of a length of fiber, where the OTDR will calculate the attenuation coefficient of the fiber, or the loss of a connector or splice. To measure the length and attenuation of the fiber, we place the markers on either end of the section of fiber we wish to measure. 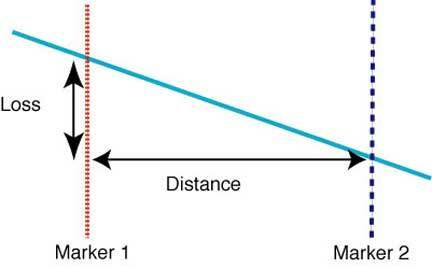 The OTDR will calculate the distance difference between the two markers and give the distance. It will also read the difference between the power levels of the two points where the markers cross the trace and calculate the loss, or difference in the two power levels in dB. Finally, it will calculate the attenuation coefficient of the fiber by dividing loss by distance and present the result in dB/km, the normal units for attenuation. In order to get a good measurement, it is necessary to find a relatively long section of fiber to give a good baseline for the measurement. Short distances will mean small amounts of loss, and the uncertainty of the measurement will be higher than if the distance is longer. It is also advisable to stay away from events like splices or connectors, as the OTDR may have some settling time after these events, especially if they are reflective, causing the trace to have nonlinearities caused by the instrument itself. The OTDR measures distance and loss between the two markers but calculates the best fit line between the two points mathematically using the "least squares" method to reduce noise. When the markers are selecting the noisy part of the fiber trace, the least squares attenuation (2-pt LSA) tool can be applied to calculate the dB loss between the cursors. Look closely and you will see a thick grey line between the markers, indicating the best fit to the trace, averaging all the noise. The OTDR measures distance to the event and loss at an event - a connector or splice - between the two markers. 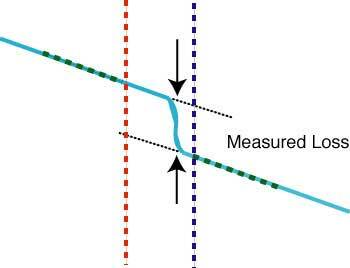 To measure splice loss, move the two markers close to the splice to be measured, having each about the same distance from the center of the splice. The splice won’t look as neat as this, with the instrument resolution and noise making the trace less sharp looking, as you will see later on. The OTDR will calculate the dB loss between the two markers, giving you a loss reading in dB. Measurements of connector loss or splices with some reflectance will look very similar, except you will see a peak at the connector, caused by the back reflection of the connector. The OTDR measures distance and loss at an event - a connector or splice - between the two markers but calculates the best fit line between the two points using the "least squares" method to reduce noise. 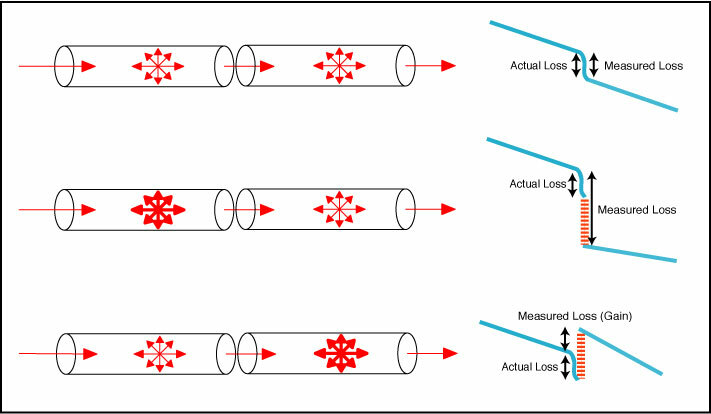 If you noticed, the markers are separated by some distance, which includes the loss of some fiber on either side of the actual connector or splice Most OTDRs will calculate the loss for you by extrapolating the fiber traces on both sides of the event and calculating the loss without any influence from the fiber length. The mathematical method uses is called "Least Squares Approximation", hence the term "LSA" used by many OTDRs in their display and setup menus. 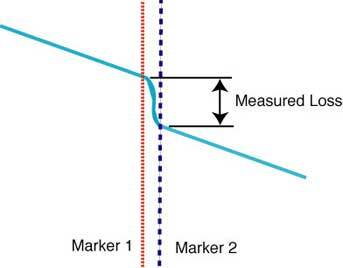 Setting LSA requires setting seveeral markers - one on the peak, the two regular markers near the event and the two end markers which define the segments used for least-squares analysis. These segments should be long enough to allow good measurement but not so long as to approach other events. The OTDR measures the amount of light that's returned from both backscatter in the fiber and reflected from a connector or splice. 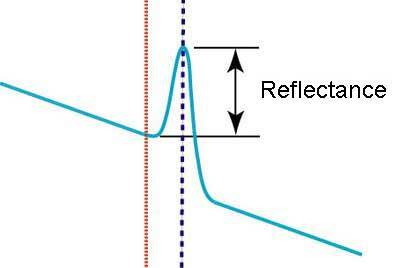 The amount of light reflected is determined by the differences in the index of refraction of the two fibers joined, a function of the composition of the glass in the fiber, or any air in the gap between the fibers, common with terminations and mechanical splices. This is a complicated process involving the baseline of the OTDR, backscatter level and power in the reflected peak. Like all backscatter measurements, it has a fairly high measurement uncertainty, but has the advantage of showing where reflective events are located so they can be corrected if necessary. More on reflectance/optical return loss testing and alternative methods . By choosing the reflectance measurement and putting the right (blue) cursor on the peak of the reflection and the left (red) cursor just to the left of the reflection, the OTDR will measure the reflectance. Comparing two traces in the same window is useful for confirming data collection and contrasting different test methods on the same fiber. Comparisons are also used to compare fiber traces during troubleshooting with traces take just after installation to see what has changed. All OTDRs offer this feature, where you can copy one trace and paste it on another to compare them. Here is an example of how you can use this feature. Note that the two traces are taken from the same multimode fiber cable plant at different test wavelengths. The major difference in the slope of the traces displays the different attenuation coefficient of the fiber. The blue line (top) represents the attenuation coefficient of the cable in at 1300 nm , the green line (bottom) represents the same cable measured at 850 nm. There is also a noticable difference in the reflectance at the splice. Variations in reflectance due to the wavelength difference is not unusual. Compare several fibers in the same cable to see if they are different. Traces taken at different times to see if the cable has changed. At different wavelengths, since fiber is more sensitive to stress at longer wavelengths, this allows finding stress points caused bu installation. 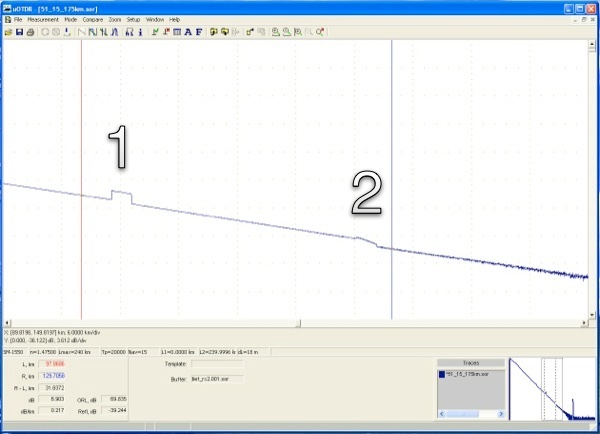 At different pulse widths (below) to decide which setting gives the best compromise between noise and resoluton or to find events lost with wide pulse widths. OTDRs can take multiple samples of the trace and average the results. The two traces pictured here were captured from the same cable plant with all of the same settings except for the number of averages. The trace on the left is only one test, while the one on the right is averaged from 1024 pulses. Notice the difference in the distance that the signal travels before it the noise level becomes significant. In the image on the left nRep = 1 or only one sample trace was taken and the noise becomes significant at only 3 km. On the right, the noise is very low all the way to the end of the cable at 5.5 km. If you are trying to get longer distances with high resolution, using more averages with a short test pulse will usually be the best choice. It will simply take longer to acquire each trace. Adjusting the pulse width is another way to get more measurement distance since the additional power in the pulse will create a bigger backscatter signal, but at the loss of resolution between events. While the longer pulses yield traces with less noise and longer distance capability, the ability to resolve and identify events becomes less, and the test pulse overloads the OTDR reducing its ability to see events nearby. Set the pulse width at the shortest width that allows the OTDR to reach the end of the cable plant with a reasonable number of averages. Obviously there are tradeoffs. If you need short test times you may compromise on a longer pulse width to reduce the noise. If you need more resolution, average more with shorter test pulses. Generally, premises cabling uses the shortest possible pulse and long haul uses a medium pulse for the first test. Then an analysis of the trace will tell the operator how to select the right compromise. Since fiber has lower loss at longer wavelength, one can also use the longer wavelength source to make measurements at longer ranges with a better signal to noise ratio. You will see this effect in the next section on comparing traces. The index of refraction is the calibration for the speed of light in the fiber which the OTDR uses to calculate distance in the fiber. Since fiber optic cable has about 1% excess fiber, the actual cable length is less than the fiber by that amount. The OTDR makes its measurements on the fiber, not the cable, so one must estimate the cable length. If you have a long length of cable with distances marked on it, you can measure it with the OTDR and use the index of refraction to calibrate to the actual cable length. If you do this, we suggest you make measurements on several fibers and average. 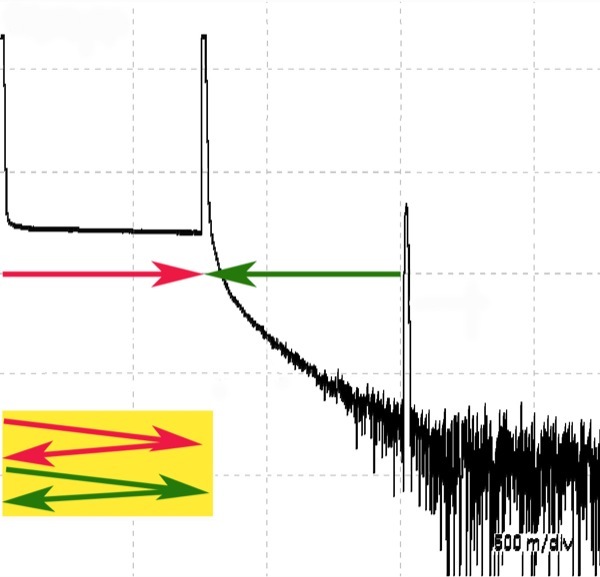 The biggest source of measurement uncertainty that occurs when testing with an OTDR is a function of the backscatter coefficient, the amount of light from the outgoing test pulse that is scattered back toward the OTDR. The OTDR looks at the returning signal and calculates loss based on the declining amount of light it sees coming back. The light scattered back for measurement is not a constant. It’s a function of the attenuation of the fiber and the diameter of the core of the fiber. Higher attenuation fiber has more attenuation because the glass in it's core scatters more light. If you look at two different fibers joined together in an OTDR, the difference in backscattering from each fiber is a major source of error. 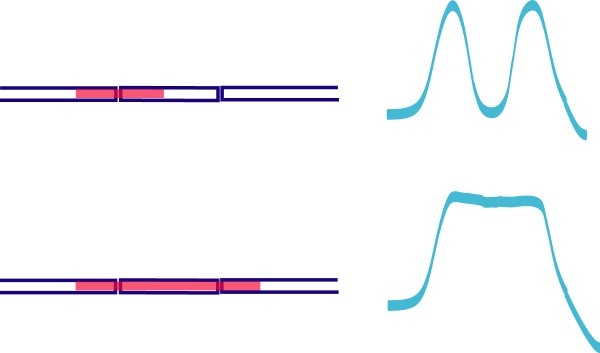 If both fibers are identical, such as splicing a broken fiber back together, the backscattering will be the same on both sides of the joint, so the OTDR will measure the actual splice loss.However, if the fibers are different, the backscatter coefficients will cause a different percentage of light to be sent back to the OTDR. If the first fiber has more attenuation than the one after the connection, the percentage of light from the OTDR test pulse will go down, so the measured loss on the OTDR will include the actual loss plus a loss error caused by the lower backscatter level, making the displayed loss greater than it actually is. Looking the opposite way, from a low attenuation fiber to a high attenuation fiber, we find the backscatter goes up, making the measured loss less than it actually is. In fact, if the change in backscatter is greater than the splice loss, this shows a “gainer”, a major confusion to new OTDR users. A real "gainer" - a splice 35 km away in an installed fiber link. Here is another trace that shows the idea of gainers as they often show up in real installations. Gainer #1 is a section of high backscatter fiber, probably with a mode field diameter difference, spliced into a link. The first splice on this segment shows a gain, but the second shows a big loss. Event 1 shows another important issue about gainers - there are "losers" too. A gainer in the opposite direction becomes a loser - the same difference in backscatter coefficient that causes the gainer in one direction causes a loser in the other, which can cause considerable problems in splicing if you only test in one direction. In the loser direction, the loss shown by the OTDR will always be the actual loss plus the difference in backscatter coefficient, so even if the loss from the actual splice is very low, the measured loss will be high. This can cause problems if you try resplicing to correct the problem, because the measurement will always be wrong and show the loss as high. You can see another good way to determine OTDR splice loss is untrustworthy with even #2. Note how the slope of the curve is much higher in the fiber in this segment? Compare this to the drawing above and you will see another way to understand when splice loss is untrustworthy. Just measure the loss of the fiber on either side of the trace and see whether the direction is high loss > low loss or vice versa. While this error source is always present, it can be practically eliminated by taking readings both ways and averaging the measurements, and many OTDRs have this programmed in their measurement routines. This is the only way to test inline splices for loss and get accurate results. Many international standards do not allow OTDRs to be used to measure the loss of an installed cable plant. Instead insertion loss testing using an OLTS or source and power meter are required. Read more about this: 5 Ways To Test Fiber and Accuracy. 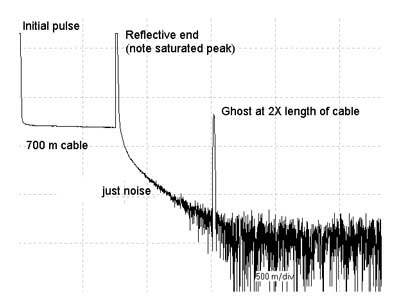 If you are testing short cables with highly reflective connectors, you will likely encounter “ghosts.” These are caused by the reflected light from the far end connector reflecting back and forth in the fiber until it is attenuated to the noise level. Ghosts are very confusing, as they seem to be real reflective events like connectors, but will not show any loss. If you find a reflective event in the trace at a point where there is not supposed to be any connection, but the connection from the launch cable to the cable under test is highly reflective, look for ghosts at multiples of the length of the launch cable or the first cable you test. On very short cables, multiple reflections can really confuse you! We once saw a cable that was tested with an OTDR and deemed bad because it was broken in the middle. In fact it was very short and the ghosted image made it look like a cable with a break in the middle, similar to the trace shown here. The tester had not looked at the distance scale or he would have noted the “break” was at 40 meters and the cable was only 40 meters long. The ghost at 80 meters looked like the end of the cable to him! You can eliminate ghosts by reducing the reflections, for example using index matching fluid on the end of the launch cable. Take the FOA Self-Study Program on OTDRs at Fiber U. (C)2008-2013, The Fiber Optic Association, Inc.